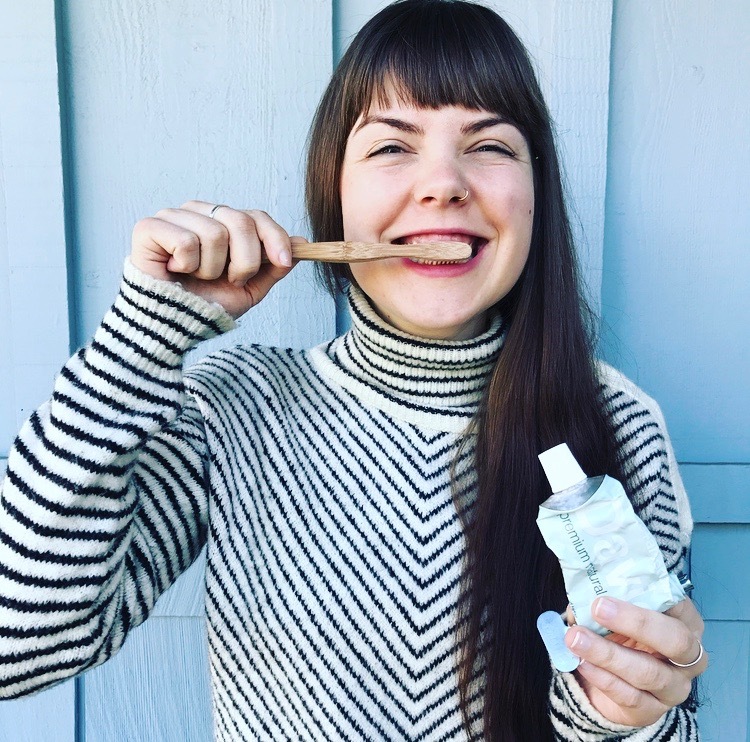 The problem with conventional and some natural toothpastes is that they contain harsh chemicals that harm the body and the environment, and they are most definitely packaged in plastic. Who wants to put something in their mouth or the mouth of their child bearing the warning, "If swallowed, call poison control"? I'm guessing most people don't. Luckily, there is a toothpaste company that's committed to providing safe products for consumers and the planet, Davids Natural Toothpaste! In the United States alone, we send over 1 billion plastic toothpaste tubes to the landfill every year. We can avoid this waste by making our own toothpaste, or choosing one made by a company that has ethical standards in place to support their workers and this Kind Planet! While it would be great if everyone made their own toothpaste, not everyone will.... I was thrilled when Davids Natural Toothpaste contacted me in December of 2016 and asked if they could send me a sample! I wanted to be able to direct those who don't want to make their own toothpaste to one that's in alignment with my social and environmental values, and Davids Natural Toothpaste is! The verdict is in. My family, friends, and I have been using Davids Natural Toothpaste for the last 3 months, and we love it! It's fresh mint flavor and effective ingredients leave the mouth feeling refreshed and very clean. Davids Natural Toothpaste is a family-owned and operated buisnesss here in the United States, providing and modeling economic integrity. The only trash producing component of this toothpaste is the plastic top, which will not be recycled (downcycled) in most cases. I haven't seen a plastic-free toothpaste top, and I'll be adding mine to my trash jar. Davids is incredibly concerned for the environment, and I have no doubt that they will switch out their cap for a plastic-free one as soon as the opportunity arises. Carton made with 100% wind energy. "The use of wind as a renewable energy reduces an estimated 4,199,796 pounds of carbon dioxide emissions annually. The greenhouse gas equivalency: comparable to taking 364 personal vehicles off the road per year" (Davids Natural Toothpaste). My sample of Davids Natural Toothpaste arrived in a box (recyclable) that was sealed with plastic tape. I contacted the company and asked if they would consider using paper tape instead. Being incredibly open-minded and awesome, they have since made the switch company wide and now ship all their wholesale and customer orders using paper tape instead! Check-out their new plastic-free shipping set-up. Davids Natural Toothpaste has generously provided us with a 20% off discount code! Just head on over to https://davids-usa.com add a few to your cart, and enter the discount code: thekindplanet at checkout. The coupon expires 3/15/17 at midnight, so don't miss out on this kind opportunity to take care of your teeth, and the environment! Brush with integrity, brush with Davids Natural Toothpaste on a bamboo toothbrush! To read more about bamboo toothbrushes and why they are a healthy choice for you and the planet, check out my post! Disclaimer: In December of 2016, Davids Natural Toothpaste sent me one tube of their toothpaste, so that I could tell you about my experience.